The U.S. Fish & Wildlife Service (Service) owns more than 400 acres of forest land located within the Columbia River Gorge of Washington State as part of the Little White Salmon National Fish Hatchery. The active management of this property provided a unique opportunity for the Service to partner with adjacent landowners to help restore native Oregon white oak habitat. This also provided an opportunity to diversify the mission of a Service National Fish Hatchery to include more than just fish production. In this case, land associated with a fish hatchery could be managed to protect water quality and provide quality habitat for at-risk wildlife species and plant communities. Essential to this effort is the Service commitment to use thorough and objective science and to approach watershed/habitat management at a landscape level. This meant that Service-owned land must be integrated into planning efforts currently ongoing on adjacent lands. Darin Stringer of Pacific Stewardship LLC authored the guiding document, Little White Salmon National Fish Hatchery Habitat Stewardship Plan – An Assessment and Framework for Ecological Restoration, prescribing on the ground restoration and long-term monitoring activities for management of Service land at the Little White Salmon National Fish Hatchery. His ability to serve as a consistent advisor to both the Service and adjacent land owners has helped strengthen the partnership between non-governmental organizations and a federal agency. Most importantly, his follow-thru beyond the plan development stage to include on-the-ground restoration activities assured management of several properties at a landscape level. He has demonstrated an intimate knowledge of the area and sensitivity for the complexity of the watershed and partnerships that comprise the area surrounding the Little White Salmon National Fish Hatchery. While restoration activities are currently in the early Plan phases, it is apparent that the end result of Darin’s work will be greatly improved habitat for the fish, wildlife and plant species that reside in the Little White Salmon River watershed. The Nature Conservancy has contracted with Darin Stringer and Pacific Stewardship since 2005 to work on diverse conservation and restoration projects in the Willamette Valley. Darin has completed timber cruises and appraisals, developed forest management plans, and coordinated and supervised restoration-oriented timber harvests. He is on the cutting edge of best management practices for oak savanna and woodland restoration and his project flexibility and creativity have produced healthier, safer oak communities. 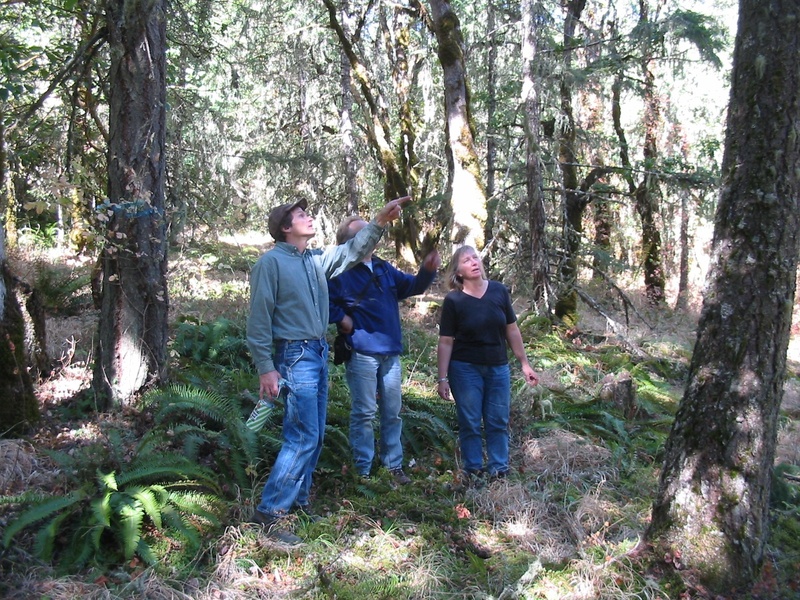 His depth of knowledge of Pacific Northwest forest stewardship coupled with his objective-oriented approach have been extremely valuable in advancing conservation projects the Conservancy is doing in Oregon. Darin has helped us with a number of habitat restoration projects, including grant preparation management and implementation. He works quickly with exemplary results–in documenting the need for restoration, planning (including grant writing–and getting grants funded! ), assigning jobs either within his company or larger contract crews. His knowledge of silviculture, invasive plant control and native plant re-establishment has been key in the success of projects on our properties. We have been most pleased with the quality of Darin’s work and recommend him without reservation. In 2003, the Deschutes Land Trust purchased a property to protect its critical salmon habitat and ended up with a 1240-acre former commercial tree farm. We subsequently hired Darin Stringer to conduct assessments and develop a management plan that would guide the restoration of historic stand conditions, enhance habitat for focal wildlife species, and protect three miles of stream. The result was a comprehensive, innovative management plan that has become the foundation for our stewardship of the property and a model for Ponderosa Pine restoration. Following the completion of the plan, the Land Trust hired Darin to begin implementation. He carried out the role of project manager with the same level of thoroughness, professionalism, and efficiency as he did during the design process. We were able to rely on him to hire and manage crews, execute treatments, and provide us with detailed summaries that helped us track our restoration progress. Throughout the assessment, design and implementation phases, Darin encouraged the Land Trust’s participation, answered countless questions, explained principles and prescriptions, welcomed feedback, facilitated collaboration with the United Stated Forest Service (property neighbor), and assisted us with public outreach and education by leading numerous tours at the preserve. As a result, the Land Trust continues to consult with him on all of our forested properties and his inventive prescriptions have inspired other private landowners and state and federal agencies to adopt and apply similar treatments across the region.